AutoMotionTV, a leader in mobile apps for dealerships, released industry best practices information for promoting mobile apps for dealerships. Years of experience launching dealer apps means we know what works and what doesn’t. AutoMotionTV analyzed and defined dealer app promotion for the best practices kit included with their Dealer App product. The company explains how to effectively distribute and promote dealer apps in order to get the app into shoppers’ hands quickly. Three main tools are included in the Dealer App best practices kit: App option code, QR codes, and social media. App Option Code allows the dealer to promote their app using their existing URL. Code is created by AutoMotionTV to embed in the dealership website. When a customer visits the dealer's page, the system automatically identifies a mobile device user and provides the option to download the app. This is a quick way to let shoppers know an app is available for the dealership. QR codes are also effective at bringing the dealership mobile app to shoppers fast. AutoMotionTV creates QR codes for clients that direct shoppers to the iTunes store and Android market to download the app. Dealers have found success placing these provided QR codes on things such as window stickers, business cards, email signatures, brochures, and marketing materials. AutoMotionTV helps promote the dealer's app using social media. 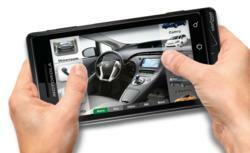 Images, video, and links included in the kit get the dealership mobile app to social networks fast. Dealers are able to spread awareness of the app in addition to providing customers a chance to experience the dealership’s app before they download. Dealership specials and promotions executed through the Dealer App can be publicized on these networks and create opportunity to connect with potential and current customers. AutoMotionTV believes even the best communication channel is nothing without users. The company works closely with each client to successfully launch and promote every app. “Years of experience launching dealer apps means we know what works and what doesn’t,” stated AutoMotionTV Sales Director, Mike Albo. Utilizing AutoMotionTV’s Dealer App Best Practices kit allowed Weber Chevrolet to obtain over 1200 downloads within the first two months of the app’s launch, pushing them to #3 for mobile traffic in their region. University Volkswagen used best practices to promote app sales and service capabilities and gathered over 1500 new users within the first three weeks of launching their dealer app.